EPO Cold Pressed 1300 mg / 120 Softgels - Nature's Way®. Important Omega-6 essential fatty acid which must be obtained in your everyday diet. 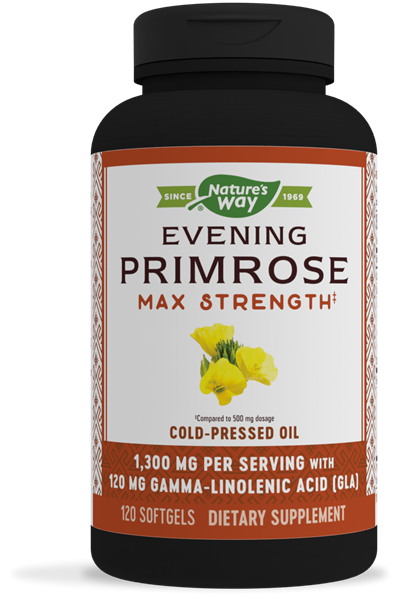 Nature's Way EfaGold® is the highest quality Evening Primrose Oil - guaranteed to contain 10% gamma-linolenic acid (GLA) from non-GMO seeds. GLA is an important Omega-6 essential fatty acid which must be obtained in your everyday diet. Take 1 softgel 2 to 3 times daily. If pregnant, nursing or taking any medications, consult a healthcare professional before use. The highest quality Borage oil - 24% gamma-linolenic acid.